Here's one I made while in a flurry of Valentine's Day preparations. It uses several products that I adore - the new background stamp called Universal Backgrounds with those beautiful music notes, our new Kraft borders and the January Stamp of the Month with that awesome butterfly! 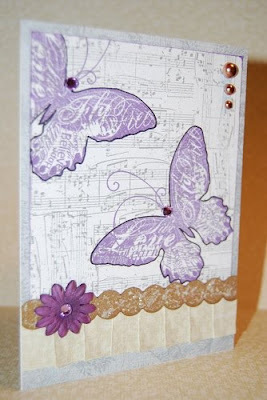 The butterfly images are actually stamped directly onto the cardstock over the music note stamping. To get the image to pop I simply outlined the butterfly with a fine tip Sharpie pen. I've added some Glitz Glitter Gel to the Kraft border strip and a little bling and we're done! Cute, cute card Paige! I like the colors and the use of the kraft borders.